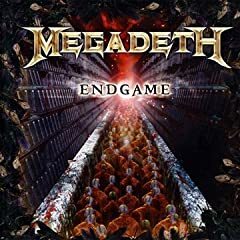 “This is the end of the road; this is the end of the line; this is the end of your life; this is the endgame” snarls Dave Mustaine on the title track of Megadeth’s new release, Endgame. Megadeth is back with a new album, a new guitarist, and a vengeance. Dave is pissed off at a lot of people and if you are a member of the government, an ex-girlfriend, or a Wall Street tycoon, prepare to taste his wrath. Backing up Dave’s lyrics is a punishing, technical, Masterpiece evoking both classic Megadeth with musical maturity. And whom should we blame for such a great sound? New guitarist, Chris Broderick. Dave compared the discovery of Broderick to “Ozzy discovering Randy Rhoads” and I’m happy to say the former Jag Panzer and Nevermore guitarist lives up to the hype. Broderick not only plays like Marty Friedman, but he puts his own stamp on the material with a sound all of his own. It’s fair to compare Broderick to a young Dave Mustaine. Want proof? The album opener, “Dialectic Chaos.” Over two minutes of a guitar duel between Mustaine and Broderick. It’s like a battle of age vs. youth. Hopefully, Chris Broderick will be around for a long time. Endgame is not Megadeth’s endgame but rather a bold new beginning.